Battlestar Galactica is an online video slot machine game released in December 2012 that is offered exclusively at online casinos powered by Microgaming. This online video slot game has 5 reels and you have 243 bet ways to win per spin! The theme of Battlestar Galactica is based upon the critically-acclaimed American science fiction TV series of the same name. In case you are not familiar with Battlestar Galactica, the story is mainly about a human civilization that left their ancestral homeworld of Kobol and went to live in a group of planets called the Twelve Colonies. The Twelve Colonies have warred for decades with Cylons (a cybernetic race) whose objective is to annihilate the human race. They devised a way to trick the humans by offering peace, and when they were successful, they heavily attacked the Twelve Colonies and the Colonial Fleet of starships that protect them. Of the entire Colonial Fleet, only the Battlestar Galactica, an enormous spacecraft carrier and battleship, seems to have survived the Cylon attack. With the guidance of Commander Adama, the Galactica and the pilots of “Viper fighters” lead a fugitive fleet of survivors, in search of the legendary 13th colony known as Earth. Microgaming online slot games are offered to players in 2 formats – download and no-download. Whether you like to download their software first or you prefer to play instantly without the need to download, then Microgaming surely has online slot machine games to accommodate your each and every slot gaming needs. Good thing that Battlestar Galactica is available for instant play, so you do not have to download anything first to find out if this game interests you enough in a way that you would like to spend some real money on it. Battlestar Galactica is a slot game specially created for those who are fans of the TV series, films, comics, and even those who played its video games. 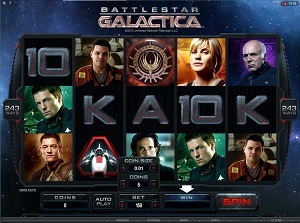 The Battlestar Galactica online slot game features 243 permanently-enabled ways to win, 3 Game Modes (Normal, Run, and Fight), scatter wins, Split Wild Symbols, Stacked Wild symbols, 2 different Free Spin Bonus Feature games (Normal mode and Fight mode), Ranking Achievements Feature, Ion Storm Wild Feature, Skill Stop Feature (you can stop the reels from spinning by clicking the Spin/Stop button), a very handy Autoplay function, and last but not least, it has a 95.36% payout ratio! When it comes to providing high quality graphics and great theme-related sounds, Microgaming does not lack any of these factors. They strive to provide players the most awesome graphics and true-to-life sound effects which make any online slot game play truly fun and exciting. Most players state that they love online slot games that are run by Microgaming because they always have impressive animated symbols and attention-grabbing yet non-intrusive sounds. In Battlestar Galactica, players are transported to outer space, where they join Commander Adama and other characters aboard the Battlestar Galactica ship, to search for the legendary 13th colony called Earth and evade/fight the Cylons (whose goal is to put an end to the human race) along the way. The symbols are taken straight from the TV series. Even the buttons such as Coins, Bet Max and Spin are designed to perfectly suit the theme of the game. Superb and awesome animated programming will be seen on the symbols when you manage to hit winning combinations with them. The overall graphic design of Battlestar Galactica shows the great and vast outer space, and below the reels you will see the Battlestar Galactica ship slowly traveling along horizontally across the game screen. The constant background music you will hear in this game is also taken straight from its TV series. When you form winning combinations, short celebratory sounds that follow the theme of the game are programmed. The card deck symbols available in the Battlestar Galactica online video slot game are 10, J, Q, K, and Ace. The regular symbols that you will see in the Battlestar Galactica online slot game are the characters Starbuck, Apollo, Baltar, Six, Col. Tigh, Helo, Ellen and Tyrol. The Wild Symbol is the Battlestar Galactica Logo symbol. It acts as a substitute for all other symbols (except for the scatter symbols) in order to help you complete a winning combination. The Battlestar Galactica Logo wild symbol can come out stacked on the reels both in the Normal Mode, and during the main Battlestar Galactica Free Spin Bonus Feature game. It is entirely possible for you to get up to 3 Battlestar Galactica Logo wild symbols to appear simultaneously on a single reel, which makes up a “Stack” of Battlestar Galactica Logo wild symbols. The Battlestar Galactica Logo wild symbol can be a Stacked Wild, and it can increase your chances of winning, by massively substituting for other symbols in order to help you complete numerous winning combinations! Please take note that you are paid out per pay way if you get multiple winning combinations. If a regular win and a Battlestar Galactica Logo wild symbol winning combination are possible on a pay way, then you are paid out the value of these two winning combinations. *In the Fight Mode, random symbols can be turned Wild at any time. A Wild symbol can Split in two and make more winning combinations. When you are able to get winning combinations with multiple Wild symbols on an enabled pay way, you will be given varying prizes (refer to the Payout table). Please take note that you are paid out per pay way if you get multiple winning combinations. If a regular win and Wild symbol winning combination are possible on a pay way, then you are paid out the value of these two winning combinations. In Battlestar Galactica, there are 2 Scatter Symbols – the Viper Mark II and the FTL scatter symbols. The Viper Mark II scatter symbols do not need to appear in a line (on an enabled pay line) for you to win. • The Viper Mark II scatter symbol can be scattered anywhere on the 5 reels for you to complete winning combinations, as long as there are 3 or more Viper Mark II scatter symbols that appear. Your winnings are calculated by multiplying the Viper Mark II scatter symbol combination payout (refer to the Payout table) by the total number of coins you’ve bet. If you get 3 or more Viper Mark II scatter symbols (found anywhere on the 5 reels), you will trigger the Free Spin Bonus Feature game. Please take note that if you get a scatter win and a regular win, then you are paid out for both of these wins, because the Viper Mark II scatter symbol is not required to come out on an enabled pay line for you to win. Scatter awards are independent from pay way awards, thus they are added to the regular win. • The FTL scatter symbol is a special symbol found only on the 3rd reel during the Run Mode of the Battlestar Galactica online slot game. When an FTL symbol appears anywhere on the 3rd reel, it will make all the card deck symbols (10, J, Q, K, and Ace) to jump off the game screen and they will be transformed into a mystery symbol to give you additional wins! Please take note that the FTL scatter symbol will not give out any winnings; however, it will let you enter the Jump Feature in the Run Mode of the Battlestar Galactica online slot game. In the Normal Mode of the Battlestar Galactica slot game, the Ion Storm Wild Bonus Feature game can be randomly triggered. Up to 5 reels can be turned into Wild reels while in the Ion Storm Wild Bonus Feature game. Please take note that the Free Spin Bonus Feature game will not be triggered during the Ion Storm Wild Bonus Feature game. Once the Ion Storm Wild Bonus Feature game is over, you will be then taken back to the main Battlestar Galactica online slot game, and your winnings from the bonus game will be included to your overall balance. If you manage to get 3 or more Viper Mark II scatter symbols that come out anywhere on the 5 reels, you will trigger the Free Spin Bonus Feature game. You will begin playing the Battlestar Galactica Free Spin Bonus Feature game with 15 Free Spins, and all your winning combination payouts in these Free Spins are tripled! Since the Viper Mark II symbol is a scatter symbol, your winnings are calculated by multiplying the Viper Mark II scatter symbols combination payout (refer to the Payout table) by the total number of coins you’ve bet. Once the Battlestar Galactica Free Spin Bonus Feature game is over, you will be then taken back to the main Battlestar Galactica online slot game, and your winnings from the Free Spin games will be included to your overall balance. If you manage to get 3 or more Viper Mark II scatter symbols that come out anywhere on the 5 reels while in the Fight Mode of the Battlestar Galactica online slot game, you will trigger the Free Spin Bonus Feature game. You will begin playing the Fight Mode Free Spin Bonus Feature game with 5 Free Spins, and you are given the opportunity to obtain additional Free Spins! When enemy ships come flying on the game screen, your battle canons will try to destroy them and if successful, you are given additional Free Spins. Once the Fight Mode Free Spin Bonus Feature game is over, you will be then taken back to the main Battlestar Galactica online slot game, and your winnings from the bonus game will be included to your overall balance. Not necessarily a bonus feature game, but the Ranking Achievements Feature guarantees players to keep on spinning the reels. Playing frequently can promote you from Civilian up to the 8th rank of Admiral, and once you do, you get to unlock many Battlestar Galactica series’ video clips. With every spin of the reels, your “experience bar” will advance towards the next rank. The more you wager, the faster you will advance in rank! Battlestar Galactica has 5 reels where you have 243 permanently-enabled bet ways to win per spin! The minimum bet is 0.01 and the maximum bet is 0.05. You can wager from 1 up to 10 coins. Thus, the maximum bet amount is 15.00. Please take note that the amounts mentioned above are in Pounds, but they will remain the same if you choose to play in US dollars, Euros, or Canadian dollars. Also, since this slot game has all pay ways permanently enabled for every spin, you cannot select or deselect pay ways. If you get multiple winning combinations, you are paid out for each of these combinations. The bet amount you play with is multiplied by a 30x bet multiplier per spin. For instance, if you bet 2 coins, then you are betting 2 coins x 30 bet multiplier which totals to 60 coins bet per spin. When you bet max on Battlestar Galactica, you can have the chance to win up to almost 15,000 coins in the main game. In Battlestar Galactica, there are 3 game modes that will surely make your game play fun and exciting! Each game mode contains different special bonus features and winning possibilities. • Normal Mode – The Battlestar Galactica Logo wild symbol can appear Stacked in the main game as well as in the Free Spin Bonus Feature game. The Ion Storm Wild Bonus Feature game and the Free Spin Bonus Feature game is available in the normal mode. The Run Mode can randomly be triggered while in the normal mode. • Run Mode – The wins pay for left to right and right to left. A special FTL scatter symbol may appear on the 3rd reel, which will cause all card deck symbols to Jump off the screen and be transformed into mystery symbols to award you additional prizes! The Fight Mode can only be triggered in the Run Mode. • Fight Mode – As the humans and Cylons battle, random symbols can be turned wild at any time. Moreover, the Wild symbols can Split into double Wilds. The Fight Mode Free Spin Bonus Feature game can be triggered when you get 3 or more Viper Mark II scatter symbols, giving you 5 Free Spins plus the opportunity to obtain extra Free Spins. Players who regularly play online casino games apparently like to stay much longer on online slot games that have an Autoplay function. It’s absolutely fantastic that Battlestar Galactica comes with a helpful Autoplay function! You can have the game spin automatically for you with the Autoplay function that can be found by clicking the Autoplay button located just beside the Bet button (left side). After customizing the Autoplay function to your preferences, just click on the Start button, and the game will automatically spin for you while you just sit back, relax, and enjoy playing this truly exciting sci-fi-themed online video slot game!